Here’s something you probably didn’t know: There are more than 2,000 species of fleas. But the cat flea (Ctenocephalides felis) is the one most often responsible for the misery of cats and dogs. And for some pets, fleas are not only an annoyance, they are also a source of an allergic reaction called flea allergy dermatitis (FAD). A pet that is allergic to flea saliva might scratch and chew at flea bites, and eventually suffer skin inflammation, hair loss, and sores. In addition to attending whatever sores or infections have resulted from the bites, treatment involves removing fleas from the pet and the pet’s environment — and keeping them off the pet and out of the pet’s living and play spaces. Flea allergy dermatitis is an allergic reaction to a flea bite that manifests in a pet’s skin. Both dogs and cats can develop FAD. Affected pets can have an extreme allergic reaction to certain proteins in the flea’s saliva, which the flea injects into the pet’s skin during biting and feeding. Some pets are so allergic that even a single bite can cause a severe reaction. Make no mistake: FAD can make pets feel miserable. If left untreated, the associated severe itching and inflammation can lead to excessive scratching and chewing that will serve to damage the skin. Secondary bacterial or fungal infections are common as a result of skin trauma and localized inflammation caused by the allergic response and will invariably lead to more scratching and chewing while potentially compounding the allergic reaction. Affected animals may scratch, bite, lick, and chew excessively at itchy and inflamed areas. Red, oozing lesions called hot spots may develop in areas where the scratching is most intense — typically on the rump, tail, and hind legs. Affected dogs usually exhibit thinning of the hair along the tail base in a classic, “Christmas tree” pattern. Affected cats will often remove large areas of hair and develop tiny scabs (called miliary dermatitis) that can cover most of their bodies, but affects their necks and rumps preferentially. This last sign is the result of flea feces. When collected and evaluated off the animal, this blackish “flea dirt” will dissolve into a rusty, bloody paste when wet. Diagnosis is typically made through examination and on finding evidence of fleas. However, because a single bite can cause a reaction and because many pets, particularly cats, can do an excellent job of grooming fleas off themselves, evidence of fleas may not be found. Allergy testing can help determine whether the pet has sensitivity to flea saliva. Because pets that are allergic to fleas are often allergic to other substances, additional allergens may be tested for as well. No known breed predisposition has yet been determined in either dogs or cats. 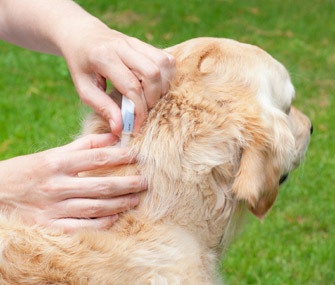 The only truly effective way to treat FAD is to completely prevent flea bites by removing fleas from a pet and his/her environment. Effective treatment targets adult (biting) fleas, but many products also target the other life stages of fleas (such as eggs and larvae), which can live in the environment and mature into adult fleas. There are many safe, effective, and easy-to-administer flea-control products. These products are typically administered by applying the medication as a fluid directly to the animal’s skin — generally between the shoulder blades or at the back of the neck — or as a daily or monthly pill. Veterinarians may recommend more than one product to most effectively kill fleas and break the flea life cycle. Once an infestation is established in any given environment, fleas can be very difficult to eliminate. Treating pets repeatedly while completely removing fleas from the affected pet’s environment is required. Therefore, all other animals in the house must also be treated with appropriate flea-control products. The house (and possibly the yard) may need to be treated with flea-control products as well. Vacuuming rugs, throwing out old pet bedding, and laundering other items may also be recommended to help remove fleas from a pet’s environment. Because many species of wildlife carry fleas, it may also be recommended that owners secure their homes and yards to prevent wildlife from inadvertently re-infesting a pet’s living and exercise areas. Secondary skin infections that develop as a result of FAD may be treated with antibiotic or antifungal medications. In addition, veterinarians may prescribe a short course of corticosteroids to reduce inflammation and itching so that pets can be comfortable sooner and so that infected areas may heal more effectively. The dedicated use of flea preventive medications in all household pets along with careful household parasite control is the only known means of flea allergy dermatitis prevention.